Now and then someone will show me a “new” picture of the H.H. Holmes “Murder Castle.” They’re almost never real – there are plenty of buildings that looks similar to it around today, and there were hundreds more a century ago. But now and then I do still run across a new shot of the actual building. If you listened to our latest podcast, you’ll know that we’re planning to do an episode on Johann Hoch, another of our antique serial killers, soon. I’ve researched Hoch quite a bit over the years, but I haven’t really dug into him like I have some others, so hit the mircofilm archives at the library today to work on cataloging all the artciles about in defunct Chicago papers like the Inter Ocean, the Daily News and the ever-enteringing Evening American. One interesting thing about the Hoch case is that for a few days there, Hoch was said to be an old pupil of H.H. Holmes. He certainly had a cottage near the “Castle” site, after all. 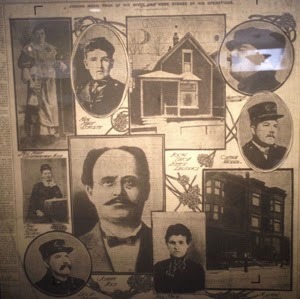 His story hit the papers in 1905; in the decade that had passed since the big Holmes investigations, newspapers had begun to run photographs, not just drawings. At least a couple of papers took the Hoch/Holmes rumors as a chance to retell the Holmes story, and a few threw in some pictures. 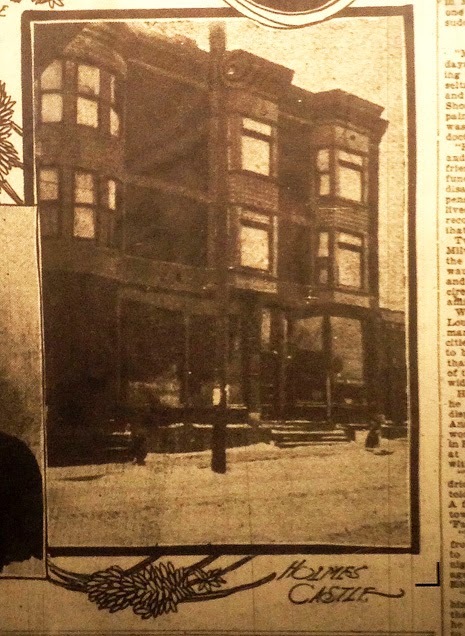 Anyway, while going through the January 29, 1905 issue of the Chicago Chronicle (defunct since 1908), there was a large spread of Hoch photos (left) that also included a fresh photo of the “Murder Castle.” It was probably taken specifically to go with this article, based on the snow on the ground (it was a rough winter). It’s not an Earth-shattering new shot, and not as nice as another shot from Holmes’ lifetime would be, but it’s a nice one (larger version below). Hoch is the mustachioed fellow who looks like guy on the Pringles can at the left. Various police officers on the case and his supposed wives make up the other pictures, except for the shot of his cottage, which was at 6430 Union, so close to the “castle” that you could probably throw a rock and hit it, if you had a good enough arm. He married a lot of women (maybe dozens) and seems to have killed about a third of him, though, like with Holmes, it can be touch to separate fact from fiction on the guy. Like Holmes, he was hanged for just one murder, though he was known to have committed others. This one, I’m quite sure, is genuine; it matches up to the other known photos and is identified as the castle by the paper in the caption. It was probably taken specifically for this paper. I’ll be giving a talk on Holmes at the Wilmette Public Library on Saturday, July 19th, at 2pm. It’s free, so come on out!